Week 12 of this season’s NFL will close with a MNF match up featuring two struggling teams. Aaron Rodgers and the Green Bay Packers have shocked most of us this season, the once power house team seems to have lost their North, they have been searching for answers all season long and have nothing to show for it. The Packers are coming off a grueling blowout loss to the Washington Redskins, who won by a whopping 42-24. They are now 4-6 for season after losing four straight contents, they are in dire need of a win this week if they hope to keep their dream of a postseason alive as faint as that may be right now. Green Bay is currently in third place in the NFC North, behind Detroit and Minnesota. The Philadelphia Eagles have completely failed to gain any momentum this season, currently in last place in the NFC East with a 5-5 record, they have almost no chance at a post season start. The revelation team of the year the Dallas Cowboys lead the NFC East 3 games ahead of their nearest competitor the New York Giants who are 7-3 followed by the Redskins who are 6-4. Notwithstanding the poor performance of the team, rookie quarterback Carson Wentz is in line to win the Offensive Rookie of the Year Award having earned the respect of fellow quarterbacks like Russell Wilson of the Seahawks who feel he has a long and successful career ahead of him. I would not be surprised if Carson Wentz is able to rip the Packers defense to shreds; Green Bay’s secondary is one of the weakest in the league, not because of lack of talent but because most of that talent has been injured. This opens the field for Carson Wentz, whom I expect will rack 350 passing yards for 3 touchdowns, will this be enough to win remains to be seen. Let us not forget that Aaron Rodgers is a great quarterback, and despite the team’s overall lack of success he has put up great numbers in some games. It would not be all that surprising for him to get at least 325 passing yards and 4 touchdowns, after all the Packers are fighting for their life in this game. 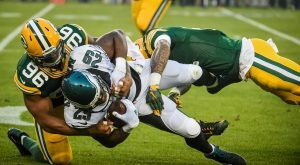 However, for Rodgers to be able to put up that kind of numbers, it means the Green Bay offensive line needs to step up their game, while they haven’t been awful they have a nagging tendency to let Rodgers get sacked quite a bit, something the Eagles will be looking for and given the chance you just know they will capitalize on it. For Green Bay to win this week they must up their defensive game, this won’t be easy considering how weak they have become because of injured star players, but if they can do this and force at least three turnovers then they have a good chance of beating Philadelphia. This will be a tough game for both franchises, Philadelphia has the edge because of their excellent home record of 4-0 this season, but I feel the Packers feel the sense of urgency to win and keep their post season dreams alive. For this reason, I am taking the 4 points and betting on the Packers. For the latest and best NFL gambling lines, visit www.AceSportsbook.com.